Practice using these by pronouncing them out loud: use them in conversations with friends for instance (it's very hard to remember a name you can't pronounce!). You can figure out the pronunciation by using the glossary at the back of your book, or by asking me. Use this evolving study guide for assistance in isolating what's important. Use the glossary at the back of your book to help keep track of who is who. Book 1 Plague. Anger of Achilles. Book 2 Dream. Trial. Catalogue of Ships. Book 3 Oaths. Viewing from the Walls. Combat of Paris & Menelaus. Book 4 Breaking of the Oaths. Agamemnon Reviews the Troops. Book 5 The Aristeia of Diomedes. Book 6 Diomedes & Glaucus. Hector and Andromache. Book 7 Combat of Hector and Ajax. Burial of the Dead. Building the Wall. Hector challenges the Greeks to single combat: Ajax is chosen by lot to fight. The duel ends without the death of either hero. Book 8 Trojans advance. Zeus stops Hera's Interference. the beautiful, yet ominous simile that ends the book. Book 9 Embassy to Achilles. The "embassy" to Achilles: an important episode. Ajax, Odysseus, and Phoenix visit Achilles in his hut to try to persuade him to rejoin the fighting. Odysseus details the gifts proffered by Agamemnon. Phoenix tells the story of Meleager. Ajax bluntly rebukes the stubborn hero. Diomedes and Odysseus are chosen by the Achaeans to go on a spying expedition at night; meanwhile, Dolon is chosen for the same activity bythe Trojans. Diomedes and Odysseus capture Dolon, who tells of the disposition of the Trojan forces; they then kill Dolon. Book 11 Aristeia of Agamemnon. Achilles send Patroclus to inquire. The Aristeia of Agamemnon. After giving the Trojans a bad time, Agamemnon is wounded and must withdraw. Book 12 Battle about the Wall. Book 13 Fighting at the Ships. Book 14 Beguilement of Zeus. Greeks advance. Book 15 Retreat to the Ships. Zeus wakes up, and is not happy. With Apollo's help, Hector recovers, and the Trojans rush upon the Greek ships. The Greek situation is now desperate. Book 16 Aristeia and Death of Patroclus. Book 17 Aristeia of Menelaus. Fight over body of Patroclus. Book 18 Shield of Achilles. A description of the shield of Achilles: city at peace, city at war; scenes of ploughing and reaping, scenes of vintage and herding; scene of the dance. Book 19 Achilles' Anger Unleashed. We now understand why the horses of Achilles were described as "talking horses"
Book 20 Battle of the Gods. Also note the ABSENCE through this sequence of the other Achaean leaders: what effect does this have? Book 21 Achilles fights the River Scamander. Book 22 Death of Hector. Book 23 Funeral Games for Patroclus. Book 24 Priam ransoms the Body of Hector. 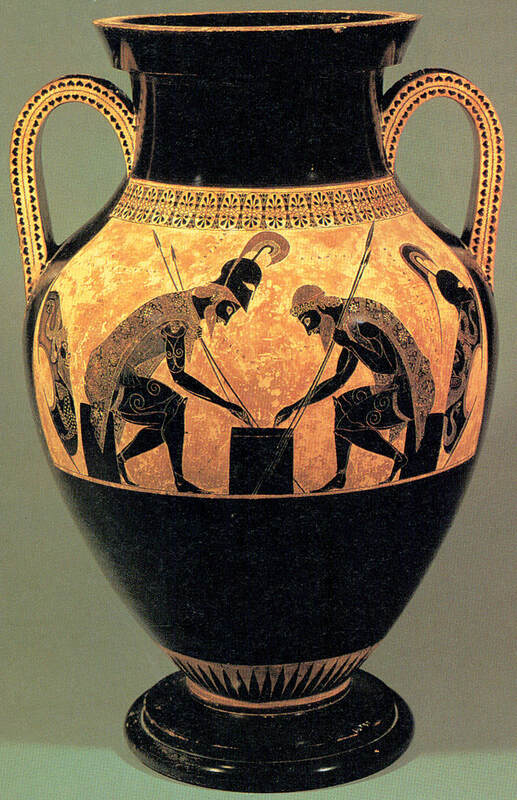 Pictured at top (close-up) and above is a black-figure terracotta amphora by the painter Exekias, depicting Achilles and Ajax Playing a Board Game. 540-530 BCE. Height 2 feet. Musei Vaticani, Rome.